Grow Local Colorado is collaborating with Governor John Hickenlooper, First Lady Helen Thorpe, and the wonderful staff at the Governor's Mansion to grow three gardens at the mansion this year! Following in the Obama's footsteps, produce and herbs grown will be used for events at the mansion and fresh, pesticide-free food will be donated to The Gathering Place. Perhaps more so, the Governor's Mansion is re-tracing the path that the Victory Gardens started in 1943. "Denver’s slogan was a 'Victory Garden on Every Lot.' Denverites did their part by planting 41,500 gardens that first season and by 1944 over 50,000 Victory Gardens were spread across the City. 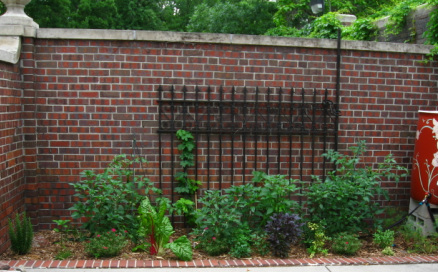 Denver’s Victory Gardens were valued that first growing season at $578,125" (http://buckfifty.org/2009/04/22/denvers-victory-gardens). If you would like to volunteer with Grow Local, contact our amazing Volunteer Coordinator, Barbara Masoner. Visit our calendar or blog if you would like to join us at an upcoming event.